Earlier this month, the Senate Judiciary Committee released a set of transcripts of interviews and exhibits related to its "Inquiry into Circumstances Surrounding Trump Tower Meeting." I am looking at the interviews from the "Russian" side of the table, the people who sat across from Don Trump Jr. as he waited expectantly to hear an incriminating story about Hillary Clinton that never came: Irakly “Ike” Kaveladze, Anatoli Samochornov, Rinat Akhmetshin, the Britisher Robert Goldstone. There is also the written testimony of Natalia Veselnitskaya. Whether there is anyone who still believes this meeting was anything but a set-up from the get-go, it's notable that these interviews show us there was not one Trump supporter among the Russians there to "help" Trump. You might even call this weird posse, "Russians for Hillary." Take Irakly "Ike" Kaveladze. He moved to the US in 1991 and became a US citizen in 2001, still retaining his Russian Federation passport. He is so pro-Hillary that until he learned that the meeting with Don Jr. would not feature information incriminating to Hillary, he didn't even want to go. Kaveladze: Look, I didn't want to be a part of a meeting where some negative information on a Presidential candidate would be discussed. So, honestly, I was considering if I realized during the lunch that the meeting would be about negative information on Ms. Clinton, I ' m not going to go to that meeting . Kaveladze: Because I don't want to be a part of a -- first of all, I voted for Hillary and my family voted for Hillary, and so I didn't want a part of this. But his own views appear to be progressive. On Facebook, he has shared clips from MSNBC host Rachel Maddow’s show, labeled former Republican presidential nominee Mitt Romney and Bush-era adviser Karl Rove as losers, and posted in favor of expanded health care coverage and more restricted access to guns. Here's Akhmetshin's take on the Trumps. Akhmetshin: No, I was amused, and I'm not a fan of the whole family, so -- I was kind of curious and amused mostly. On the day of the meeting, it seems that Akhmetshin and Lieberman rode up together from Washington to New York on the morning Acela. They were going to attend a play that evening, Akhmetshin explained, in which a Russian relative of Akhmetshin's was appearing. Akhmetshin, however, was just minding his own business, shopping, "holding a shirt, so I had to manage the phone and the shirt," when Veselnitskaya called him up and invited him to lunch. (Lieberman was off attending to some personal business in blissful ignorance.) At lunch, Veselnitskay invited Akhmetshin along to Trump Tower to the meeting with "Trump's son." All very spontaneous. That evening, Lieberman, Akhmetshin, also Veselnitskaya and Somochornov, go to the "beautiful" play, starring Akhmetshin's relative. A. I didn't mention to him. Q. I'm sorry. I'm not sure if I understood you . Did you say that Ed Lieberman was a close confidant of Hillary Clinton? Translation -- My head is exploding, what did you just say???? A. His wife was close confidante of Hillary Clinton . A. Oh, he knew her well, I'm sure . Q. And so knowing that, it never occurred to you to say, "Hey, I just had a meeting where Hillary Clinton's name came up "? A. Again, I try to be discreet . Not to be cute, but this still isn't answering whether Akhmetshin and Lieberman discussed the meeting, regardless of how the subject came up. A. I don't even remember now . Q: Did anyone discuss "hacked" emails belonging to the Democratic National Committee, Hillary Clinton, John Podesta or the Clinton campaign? If so, please explain. A: No, no one did. I was not even aware of this then, since I was at that time not very interested in politics and what was happening with the pre-election campaigns in the United States. I didn't care who would win. The day after Inauguration Day 2017, Veselnitskaya seemed to care very much. 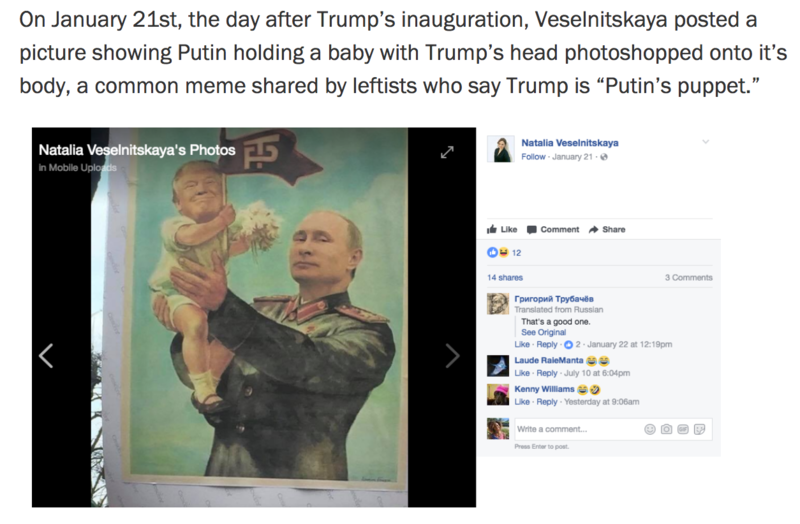 Here is the poisonously anti-Trump "Putin's puppet" meme that she posted on her Facebook page, since removed. Also, three of the four (that we know of) have links to Kremlin intelligence. Akhmetshin, identified by the House Intelligence Committee as a "former Soviet intelligence officer," will zig-zag around the question of the nature of his intelligence ties, seemingly depending on whom he is with. The New York Times notes this version of the story: "He told some journalists that he worked with a military counterintelligence unit, but said he never joined Russian intelligence services — unlike his father, sister and godfather" (Emphasis added.) Clearly, it's all in the KGB family. This may be a silly question, but why do Sovet-born bankers with ties to the KGB get to move to California at any time? The evidence leading to the big Veselnitskaya "shocker" -- that the Russian lawyer was an informant for the Russian government all along -- was a set of her emails, which suddenly and anonymously appeared in the electronic dropbox of Dossier, an organization set up by Mikhail B. Khodorkovsky, "the former tycoon" the New York Times tells us (not oligarch? ), "who was stripped of his oil holdings, imprisoned and then exiled from his native Russia." Note that the release date of the Veselnitskaya story, April 27, 2018, is the same as that of the final report by the House Intelligence Committee on Russia. What do you say Agent Veselnitskaya story was a little "insurance" against the report being a blockbuster? Nice distraction, if necessary. On April 28, 2018, Bill Browder pops up on NPR to comment. SIMON: Let's start with the story of this lawyer, Natalia Veselnitskaya. She told NBC, I am a lawyer. I am an informant for the Russian government - after claiming that she wasn't anybody's agent. You know her, right? BROWDER: I know her really well. She was trying to repeal the Magnitsky Act, which I was very instrumental in passing. And she did a lot of terrible things in Washington and New York to try to do that. And she had always presented herself as some kind of private citizen. When she calls herself now an informant, I would say that doesn't go nearly as far as what she really is. She is an agent of the Russian government. And the emails that came out yesterday pretty much prove that. And so what we know now is that an agent of the Russian government, proven by emails, showed up in Trump Tower, trying to get Donald Trump Jr. to convince his father to repeal an anti-Russian Magnitsky sanctions act. Maybe the host is supposed to say, AHA! But this is not an "AHA" moment. Three of the four Russians at the Trump Tower meeting (at least) should be regarded as actual or potential Kremlin agents, which tells us we are looking at some kind of act by some kind of hostile penetration. Domestic (Clinton)? Foreign (Russian)? Both? Or were they just FBI "informants," too? Given Akhmetshin's pipeline into Clintonworld via Edward Lieberman, plus what we now know of these Russians being also, politically speaking, on the Hillary team, and professionally not exactly strangers to the ways of Kremlin intelligence, we've got some dots that don't connect, not the way we're told. Remember, too, that Veselnitskaya had earlier been granted special immigration paraole by Obama AG Loretta Lynch. SIMON: Now, Republicans on the House intelligence committee released that report this week, heavily redacted, saying that the Trump campaign did not collude with Russia. You believe they missed something? BROWDER: Well, I actually don't believe either the Republicans or the Democrats when they produce these reports because these are not objective reports. Everybody is arguing their partisan interests. How non-partisan and above it all -- why, no wonder Browder renounced his American citizenship -- so declasse, so bourgeois! The one report I will believe will be the report of Robert Mueller. He's a totally impartial law enforcement investigator who will come to the truth, whether it was collusion or it wasn't collusion. But when a partisan group puts together a report, it doesn't really hold much credibility for me. Heed Browder's voice of agit prop. It is telling us what we need to know.